Heraldic Shields/Wall Plaques are a very good choice for any company when it comes to Promotions, Events, Awards, Advertising, Presentations, Trophies, gifts, and mementos etc. In Most cases a Company will have a logo, which can be displayed on a Heraldic Shield/Wall Plaque representing the company in a most unique and effective way. The uses are endless, some examples include gifts for employees, awards for recognition of achievement, advertising and promotion in order to attract interest and gain future business, Trophies for sporting events etc. If required just text alone can be displayed on a Heraldic Shield/Wall Plaque depending on a customers requirements. Promotional Merchandise Companies find Rowan Heraldic Shields/Wall Plaques a very effective promotional item, which can be included into their product range and offered to customers. Rowan Heraldic Shields/Wall Plaques are also beneficial to agents who have outlets in many countries and distribute goods worldwide. 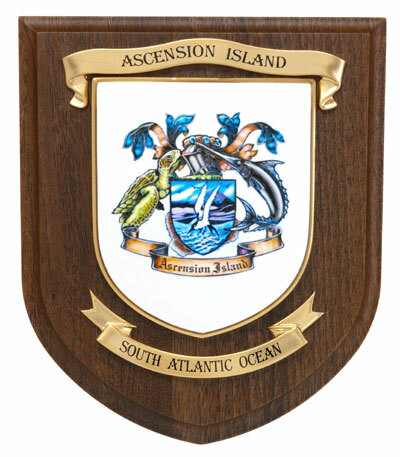 A good example is the "Ascension Island" Heraldic Shield/Wall Plaque (see image on left) which was an order placed by a hotel manager based on the Ascension Island who was looking for a quality gift/memento that represented the Island, to display in his hotel gift shop in order to sell them on to passing tourists/travelers. The goods were delivered to the hotel manager's agent in England who took charge of the administration and distribution of the Heraldic Shields/Wall Plaques, reaching their final destination, the Ascension Island.